Ian Dawson Tyson CM AOE (born 25 September 1933) is a Canadian singer-songwriter, best known for his song "Four Strong Winds". He was also one half of the duo Ian & Sylvia. Tyson was born to British immigrants in Victoria, and grew up in Duncan B.C. A rodeo rider in his late teens and early twenties, he took up the guitar while recovering from an injury he sustained in a fall. He has named fellow Canadian country artist Wilf Carter as a musical influence. He made his singing debut at the Heidelberg Café in Vancouver, British Columbia in 1956 and played with a rock and roll band, "The Sensational Stripes." He graduated from the Vancouver School of Art in 1958. After graduation, Tyson moved to Toronto, Ontario where he commenced a job as a commercial artist. There he performed in local clubs and in 1959 began to sing on occasion with Sylvia Fricker. By early 1959 Tyson and Fricker were performing part-time at the Village Corner as "Ian & Sylvia". The pair became a full-time musical act in 1961 and married four years later. In 1969, they formed and fronted the group The Great Speckled Bird. Residing in southern Alberta, the Tysons toured all over the world. During their years together, the pair released 13 albums of folk and country music. From 1971 to 1975, Tyson hosted a national television program, The Ian Tyson Show, on CTV, based on the 1970–71 season music show Nashville North, later titled Nashville Now. As of 1980, Tyson became associated with Calgary music manager and producer Neil MacGonigill. Tyson decided to concentrate on country and cowboy music, resulting in the well-received 1983 album, Old Corrals and Sagebrush, released on Columbia Records. In 1989, Tyson was inducted into the Canadian Country Music Hall of Fame. In 2005, CBC Radio One listeners chose his song "Four Strong Winds" as the greatest Canadian song of all time on the series 50 Tracks: The Canadian Version. There was strong momentum for him to be nominated the Greatest Canadian, but he fell short. He has been a strong influence on many Canadian artists, including Neil Young, who recorded "Four Strong Winds" for Comes a Time (1978). Johnny Cash would also record the same song for American V: A Hundred Highways (2006). Judy Collins recorded a version of his popular song, "Someday Soon", in 1968. Bob Dylan and the Band recorded his song "One Single River" in Woodstock, NY in 1967. The recording can be found on the unreleased Genuine Basement Tapes, vol. I. In 2006, Tyson sustained irreversible scarring to his vocal cords as a result of a concert at the Havelock Country Jamboree followed a year later by a virus contracted during a flight to Denver. This resulted in a notable loss of the remarkable quality and range he was known for; he has self-described his new sound as "gravelly". Notwithstanding, he released the album "From Yellowhead to Yellowstone and Other Love Stories" in 2008 to high critical praise. He was nominated for a 2009 Canadian Folk Music Awards for Solo Artist of the Year. The album includes a song about Canadian hockey broadcasting icon Don Cherry and the passing of his wife Rose, a rare Tyson cover written by Toronto songwriter Jay Aymar. In 2010, Tyson put out his memoir The Long Trail: My Life in the West. Co-written with Calgary journalist Jeremy Klaszus, the book "alternates between autobiography and a broader study of [Tyson's] relationship to the 'West' – both as a fading reality and a cultural ideal." CBC's Michael Enright said the book is like Tyson himself – "straightforward, unglazed and honest." Tyson has also written a book of young adult fiction about his song "La Primera", called La Primera: The Story of Wild Mustangs. Tyson's first marriage, to Sylvia Fricker Tyson, ended in an amicable divorce in 1975. Their son Clay (Clayton Dawson Tyson, born 1966) was also a musical performer, and has since moved to a career modifying racing bikes. Ian Tyson married Twylla Dvorkin in 1986, and their daughter Adelita was born c. 1987. Tyson's second marriage ended in divorce which was made official in early 2008, several years after separating from Dvorkin. Tyson became a Member of the Order of Canada in October 1994, and was inducted into the Alberta Order of Excellence in 2006. In 2003, Tyson received a Governor General's Performing Arts Award. 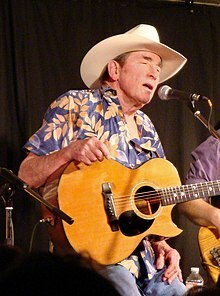 A tribute CD to Ian Tyson, The Gift, was released in 2007 on Stony Plain Records featuring "Someday Soon" done by Doug Andrew with Buddy Cage on pedal steel guitar (Buddy played in Great Speckled Bird), "Four Strong Winds" recorded by Blue Rodeo, plus another 13 of Tyson's best known songs done by major folk and country artists. The album is titled after a song of Tyson's, which itself is a tribute to Charles Marion Russell. The 1987 album Cowboyography contained two songs that were later chosen by the Western Writers of America as among the Top 100 Western Songs of all time: "Navajo Rug" and "Summer Wages". A ^ "Love Can Bless the Soul of Anyone" peaked at number 61 on the RPM Top Singles chart in Canada. ^ Kolya Witko (Fall–Winter 2009). "Ian Tyson: The many faces of a Canadian icon". Alternativetrends.com. Retrieved 2011-03-05. ^ Larry LeBlanc (9 September 2000). Tyson album, stage show, draw on her life and long career in music. Billboard. Nielsen Business Media, Inc. pp. 60–. ISSN 0006-2510. ^ Wedge, Pip (February 2003). "Ian Tyson Show". Canadian Communications Foundation. Retrieved 2009-07-01. ^ Heath McCoy, Field of dreamers. Calgary Herald via Canada.com, June 19, 2007. Retrieved 2015-04-03. ^ Heylin, Clinton (1995). Bob Dylan: The Recording Sessions 1960–1994. St. Martin's Griffin. p. 55. ISBN 978-0312150679. Archived from the original on 21 January 2012. ^ "Ian Tyson's Brave New CD". Macleans. 1 December 2008. Retrieved 2011-03-05. ^ "Ian Tyson". Canadian Encyclopedia. Retrieved 2011-03-05. ^ Tyson, Ian; Klaszus, Jeremy (October 2010). The Long Trail: My Life in the West. Random House. ISBN 978-0-307-35935-3. ^ Volmers, Eric (23 October 2010). "Truly Tyson". Calgary Herald. Retrieved 2010-11-01. ^ Tyson, Ian (24 October 2010). "Interview with Ian Tyson". The Sunday Edition (Interview). Interview with Michael Enright. Toronto: CBC. Retrieved 2010-11-01. ^ Tyson, Ian (2009). La primera : the story of wild mustangs. Paintings by Adeline Halvorson. Toronto: Tundra Books. ISBN 978-0-88776-863-7. OCLC 226999077. ^ Ian: "Silvia and I had parted, amicably, and I came out to Alberta..." in documentary "Songs from the Gravel Road". Bravo network. 2010. Retrieved 2012-02-11. ^ "They're partners in life as well as in music, which must have its difficult moments like the prospect of having to sing with someone you were maybe not speaking to. But they certainly have made that work, what with that thing rolling around on the rug, young Clayton Dawson, herein and hereafter referred to as 'Mr. Spoons.'" From the jacket notes (by John Court) to Ian and Sylvia's LP "Lovin' Sound", MGM 4388, 1967. Quoted in Mudcat Forum by Dale Rose, 1999-04-16; accessed 2011-05-08. ^ "Clay Tyson". Living Legends Music. 2006–2008. Retrieved 2011-04-19. ^ a b Lederman, Marsha (30 March 2009). "Tyson comes clean". The Globe and Mail. Retrieved 2009-07-01. ^ "Biography (Ian Tyson)". NME. Retrieved 2009-07-01. ^ Ingram, David (16 November 2000). "A true son of the west". Canada Now. CBC Television. Retrieved 2009-07-01. ^ Johnson, Brian D. (24 November 2008). "The end of love and a famous voice". Retrieved 2009-07-01. ^ Marchand, Philip (6 February 2006). "Recent Reviews". Toronto Star. 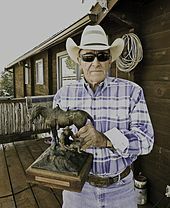 ^ "Order of Canada citation: Ian Tyson, C.M., A.O.E.". Governor General of Canada. Retrieved 2009-07-01. ^ "Ian Tyson OC, D Litt (hon), LLD (hon)". Government of Alberta. Retrieved 2009-07-01. ^ "Ian Tyson biography". Governor General's Performing Arts Awards Foundation. Retrieved 2013-11-25. "Tyson, Ian". Encyclopedia of Canadian Musicians. Historica Foundation of Canada. Retrieved 2009-07-15.